Water resources in tourist islands have been severely threatened, especially in the Galápagos Islands, where the increased local population has generated attractive income from the tourist services. In addition, the data regarding water supply and demand are scarce. 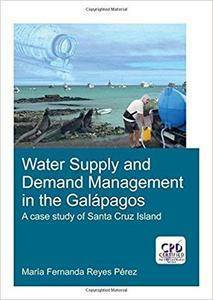 This study investigates water supply and demand in Santa Cruz, the most populated island of Galápagos. The research encompasses a thorough assessment of the water supply crisis, as well as the quantification of water demand from different categories (domestic, tourist, restaurants and laundries) through surveys, in the absence of water metering. Also, specific water demand was assessed by installing 18 water meters. The results yield a wide range of water consumption, questioning the current assumption of water scarcity. Furthermore, a prognosis of water supply and demand was carried out, and also several intervention strategies were proposed such as rainwater harvesting, greywater recycling, leakage reduction, water meter installation, water demand reduction, as well as seawater desalination to cope with the future population growth. Due to the fragility of the ecosystem, these strategies were assessed through a Multi-Criteria Decision Analysis, considering environmental, technical, economic and social aspects, as well as relevant stakeholders’ perspectives. finally, the water supply network of Puerto Ayora was evaluated in order to understand the need of the current intermittent supply regime. A methodology was developed to estimate the overflow of the domestic roof tanks (a common incidence amongst local population). The results question the practicality of individual household storage. The final results show that the current situation in terms of the lack of water quantity may not be real, as it has been thought for the last decades. The water issues refer more importantly to the water quality, as well as to the lack of proper water management practices.